in Less than 20 Minutes..."
As you know, a great sales letter is the key to becoming very successful in selling any product or service online. Not just the letter itself, but also the presentation of that letter in a professional way using time tested techniques is vital to its effectiveness. You wouldn't want this guy to be your salesperson, right? Then you wouldn't want to give the same kind of experience to your website customers. Your sales letter is your virtual salesperson. He is there 24/7 selling your product. You want this sales person to be just perfect! You want him to give your visitors a great experience as visitors to your site, then take them by the hand and convert them to paying customers. If you are like me, you are absolutely shaking scared at the thought of writing a sales letter, creating an eye-pulling auction listing or building a website to sell your product on the Internet. "Enter your Name and Primary email Below, and we will send you all the information and free gifts"
However, I 've built websites just like the one you are looking at right now in less than 18 minutes"
This incredible software not only guides you step by step as you carefully craft your sales letter, it practically writes it for you! Not only does it totally format your sales letter for you, just like the sales letter you are reading now, formatted, it also builds your sales page website for you! Just Fill In The Blanks! - All you have to do is go through each step and add a bit of text to the empty boxes! There is a "Preview" button so you can view your sales letter at any time and make sure it's coming along nicely. Disclaimer: This feature can be addicting. 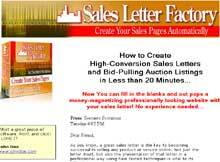 Save your Sales Letter Projects! - I say starting from scratch every time is for the birds! Just hit the save button to save your template, then on your next sales letter, load it up again into the software and change the product details! or even the template itself. You will see your sales letter taking different shapes and sizes with the click of a few buttons. 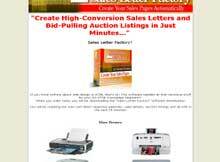 No Copywriting Experience Needed- You don't need to be a copywriter to use Sales Letter Factory. The software is smart enough to do that for you. Even if you are a copywriter, SLF will save you a tremendous amount of time putting everything together. It's Flexible for Split Testing- With "Sales Letter Factory", you can change the color, size and font of almost every part of your sales letter. This is a great feature, especially if you are big with testing like I am. You can just create 2 slightly different versions of the same page to test conversions, literally in seconds. Next time, just fire-up your Sales Letter Factory, make some more changes and test the new page against your control. Then "Sales Letter Factory" is just what you need! I was totally BLOWN AWAY..."
As a marketer, I have been always looking for the best way for my customers to create their websites in a fast and easy way. However, when you showed me this software, I was totally BLOWN AWAY! I could simply plug in all the important segments to manage a powerful website in less than 10 Minutes. This is much better than sitting down and thinking for the whole day how to create a powerful sales letter. I highly recommend it to everyone!" If you know nothing about web design or HTML that's ok! This software handles all that technical stuff for you! NO HTML Knowledge Required!!! 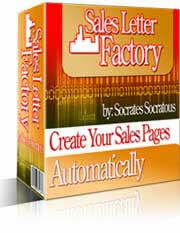 When you order today you will be downloading the "Sales Letter Factory" software immediately! 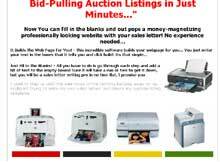 You will be cranking out your own direct response websites, sales letters, auction listings and all within the next hour! Rumor has it that pictures worth a thousand words (each)! 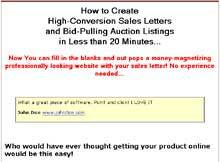 Look at how easy it is to start creating your own sales letters in minutes! 2 Column 4 Picture High impact mini site template. Testimonials are shown on the left of your sales message, one below the other. A proven way to increase response. Direct Response Type Sales letter template. High impact mini site template. It allows for header, footer, background image and product image (software box, or ebook cover). This is one of the most used type of minisite. The simple reason: It works! This is a classic, direct response type template. It will generate a letter with a nice flow leading into the call to order. Minisite Type template with 5 images. Main image will appear centered below your headlines and the other 4 will be arranged strategically in a 2X2 table within the flow of your sales letter. Brochure type template with 5 images. Images will be nicely arranged both within the flow of the sales letter and also towards the end to capture more attention. These graphics (Headers, background images, buttons) have been created by professional graphic designers. They come in fully customizable Adobe photoshop format so that you can change them to fit your business. You can change virtually anything you want. You can see samples of the fully customizable header graphics you will get below. MORE THAN 244 MegaBytes are included in this product! Think about how many times you have to pay $350+ if you are really serious about making it online? Recently, I 've had more than 30 unique items selling on ebay at the same time... I can't even imagine how much that would have cost me if I hired it out. Most people, just like you, will ditch the greatest opportunity altogether just thinking of this overhead. Not Anymore!!! This is your lucky day. 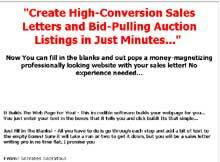 For only $97 $67 today, you can create Unlimited Sales letters and Auction listings. We are a serious company and we intend to stay in the market for a long time. We take our business very seriously and after-sale support is our top priority. Unlike a lot of other "internet marketing" websites out there, we actually provide our customers with the assistance they really need to fully utilize our products and grow with us. Our full time support team will be there to answer all of your questions quickly. Great Ideas for Hidden Streams of Income!! If You are a graphic designer or know how to create sales letters from scratch, you can develop Templates that work with Sales Letter Factory and sell them to Sales Letter Factory Users. We can also assist with this if you are interested. This is a small sum to pay to start finally taking steps towards getting your website online and starting to live the work at home lifestyle! Look at it this way -- $97 $67 is really a painless drop in the bucket to be able to get your hands on Sales Letter Factory and start using it right away to improve your sales and subsequently your lifestyle! You Really Can't Afford Not To Invest In 'Sales Letter Factory'. It's easy to get started right away. With our Money Back Guarantee, you have absolutely nothing to lose and so, so much to gain! My Iron Clad 100% 60-day full money back guarantee! - If my software does not produce all I claim it does, I will refund you all your money with no questions asked! I'm so certain that you will be ecstatic about my program that I let you try it with absolutely no risk for 60 days! You can download the software right now, even if it’s 3:00 in the morning). Yes! Socrates, I Want This Incredible Package! Count Me In Right Now! Take Action, And Start Making A Great Living Online Right Now! Not Tomorrow, Start Today! You are minutes away from being able to get your website online in an easy and automated way. Our software will practically write your sales letter for you. P.S. You will be so glad that you can finally stop trying to get your website online the hard way. Don't spend weeks trying to "figure it out", let Sales Letter Factory do it all for you! Dont miss out on the cutting edge of internet marketing. Sign up above! Your privacy is very Important to us. We hate spam too! © 2004-2006 Underfox Corporation. All rights reserved Worldwide. 5318 E. 2nd Street #663, Long Beach, CA 90803-5354.